The Royal Enfield Bullet — a motorcycle that has caused sleepless nights for many men across the country and beyond. It’s a special brand of insomnia brought about either by the lust of possessing a Bullet or the trepidation of the bike not starting the next morning for those who already own one. Although the Bullet name was first used by Royal Enfield back in the thirties, the forebear of the bike we know today made its debut in 1947 just after the Second World War came to an end. This model was the first British motorcycle that featured something we all now take for granted — the swinging-arm rear suspension. When riders began to compete in trials events with their Bullets, the trophy cabinet in Royal Enfield’s Redditch factory began to fill up rather quickly, with more than 500 podium finishes in the fifties alone. While the competition had to make do with plungers, sprung hubs or simply no rear suspension at all on their bikes, the Bullets, with their sprung swinging arms, began to dominate the sport. The Bullet was such a game changer that every single British motorcycle manufacturer took notice and cobbled its own versions of the Royal Enfield’s swinging-arm suspension with various rates of success. Another peculiarity of the Royal Enfield Bullet when launched in the forties was the semi-unit construction of its engine and gearbox. Unlike the majority of other British motorcycles of the period which held their engines and gearboxes separately onto the frame using mounting plates, the Bullet’s transmission was bolted directly onto the engine crankcase. This resulted in an extremely rigid chunk of metal which stiffened up the frame considerably when bolted in as a stressed member. Couple this with 19-inch tyres at the front and rear and what you got was the quintessential go-anywhere capability that made the Bullet so suitable for what the Indian Army wanted and subsequently, 800 bikes were requisitioned from Royal Enfield. This order was the very one which ushered the birth of the marque in the country. And the Bullet thrived in India. So much so that even when the parent company withered and died in England, the Enfield factory in Chennai kept churning out clones of the 1955 Bullet till just under 10 years ago. The robust nature of the Bullet along with the ability to negotiate even the worst roads — attributes that attracted the Indian Army to this Enfield in the first place — garnered an expansive fan following in the civilian market as well. The cast-iron-engined Bullet is a time machine on two wheels, ever eager to take you back to the fifties with every twist of the throttle, all the while shifting cogs using the lever hanging off the Albion gearbox on the right. As the heavy crank begins to spin faster and faster, the deep thump from the chrome exhaust begins to turn into a resonating blat, and the acceleration is unhurried and dignified. Which is great when you want to amble down the green lanes in the countryside. But for serious tarmac scratching, the Bullet needs considerable tweaking. In the heyday of the British motorcycling industry, youngsters with limited means were hard at work trying to make their motorcycles go faster. Shedding weight off the bikes, dropping the bars and pushing the foot pegs toward the rear to gain a more aerodynamic racing crouch, all of which helped push that speedometer needle a bit further. So was born the café racer, an ode to what the Royal Enfield Continental GT strives to be today. Essentially a factory-built café racer, complete with a warranty card and a mass-produced bum-stop seat. Displacing 535cc from the relatively new UC engine, the GT is as similar as it is different to the original Royal Enfield Crusader Sports and other café racers that has been the inspiration behind its design. Give it the stick and the motor gushes out torque like the quintessential big-bore British thumper of yore. On the after-run, the megaphone snorts and hisses, putting a wide smile on your face. True to its styling, the Continental GT is best sampled whilst hurrying up a nice windy road surfaced with faultless tarmac. The cradle frame and the suspension come together to provide substantial corner-carving capability, while the disc brakes fore and aft, albeit wooden in feel, inspire confidence to shed speed at a rate which would be impossible for the old drum brakes. The carburettor has made way for fuel injection on the Continental GT, making the throttle response crisper than ever before. But unlike the older bikes, getting more juice into the combustion chamber to go faster isn’t just a matter of lifting the clip on the jet needle by a slot or two or getting the main jet acquainted with a needle file. There are electronics to contend with, and depending on how well versed you are with a laptop and software, the ECU could be coaxed into pushing out a few more horses from the motor. The tarmac-biased nature of the Continental GT makes itself known the minute the wheels encounter road undulations. The stiff suspension, coupled with the bum-stop seat and low set clip-on ’bars, ensure that the jolts from potholes are transferred almost devoid of any filtering straight to the rider. In short, the Continental GT isn’t really the Royal Enfield that you would want to be riding to Ladakh on. However, this is where the Himalayan steps in, the Royal Enfield that is touted to make a molehill out of the mountain. 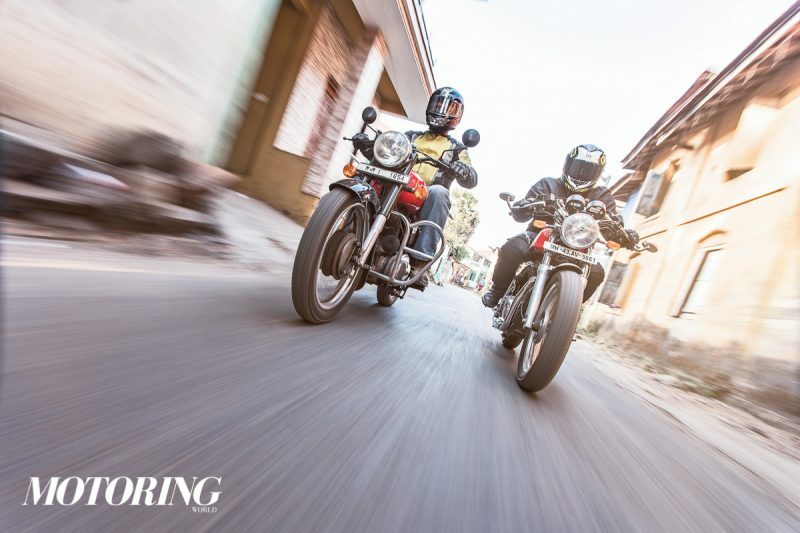 This is the biggest departure from the Bullet that Enfield has ever made (apart from trying to sell radios and scooters) in India, yet, just like the Continental GT and the café racer genre of motorcycles, the Himalayan is firmly entwined with the Bullet. They both share an affinity for mud. With its softly-sprung long-travel suspension and on/off-road tyres, the Himalayan is the only go-anywhere adventure tourer in its segment. Rumbling up goat tracks and dry river beds is a breeze and standing on the ’pegs feels absolutely natural. Dirt-friendly details abound on the Himalayan, like the rubber inserts on the rider’s footrests that can be removed with one spanner, leaving behind bear-trap ’pegs that are ideal for gripping the soles of your boots when riding through slippery stuff. Or the digital compass for that matter, although rather redundant today with GPS being easy to access, which builds on to that trailblazer pitch which the Himalayan is built on. When it comes to the Himalayan’s engine, the spec sheet is worlds apart from what the Bullet enthusiast would look for in a Royal Enfield. The motor runs overhead cams now and does not really feel like a retro powerplant which is honestly at loggerheads with the period styling of the engine’s externals. What is retained is the wide spread of torque and this will certainly keep Royal Enfield buffs happy. There’s plenty to be had in every gear almost right across the rev range. Just the thing for all-round touring duty, then. On the superslab, however, you might yearn for 10 more horses. The Himalayan seems like it will hold 100 kph all day, but at more than that, it seems to work harder than what it would prefer. Will this motor make it into the rest of the Royal Enfield’s portfolio? This remains left to be seen, but I have a hunch that it will. Many might grumble and argue that modern Royal Enfields aren’t as current as the Japanese competition and to be fair, this is true to a large extent. But looking back at the Bullet that built the foundations of Royal Enfield in India, and riding some of the bikes that continue to grow the marque in the country, it is easy to see the genes trickling down through the years but with technology gently making its presence felt. This is evolution, my dear friends, and nature takes its own sweet time!